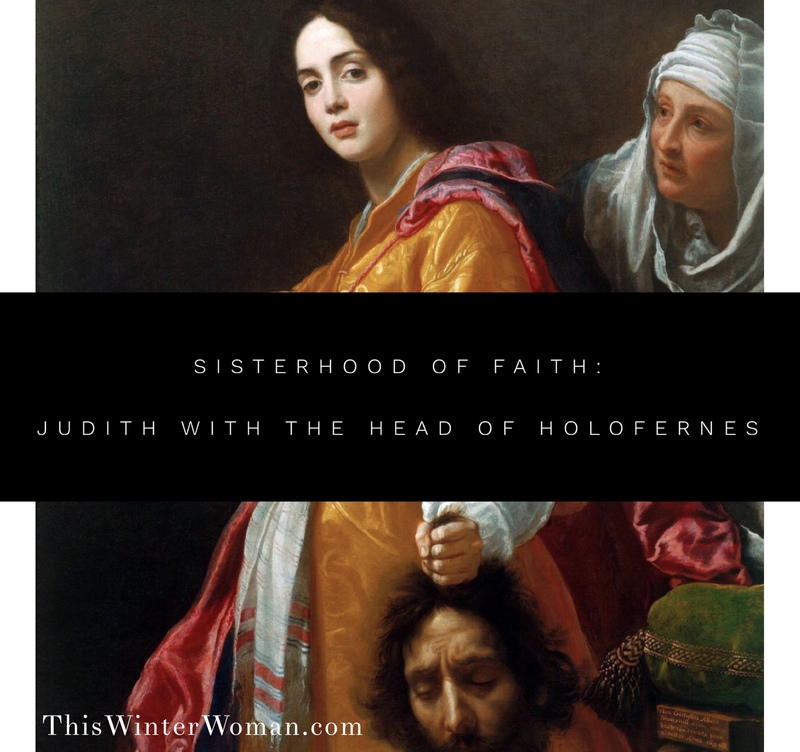 As a second installment of the Sisterhood of Faith series I give you Judith- Heroine of the Jewish people. 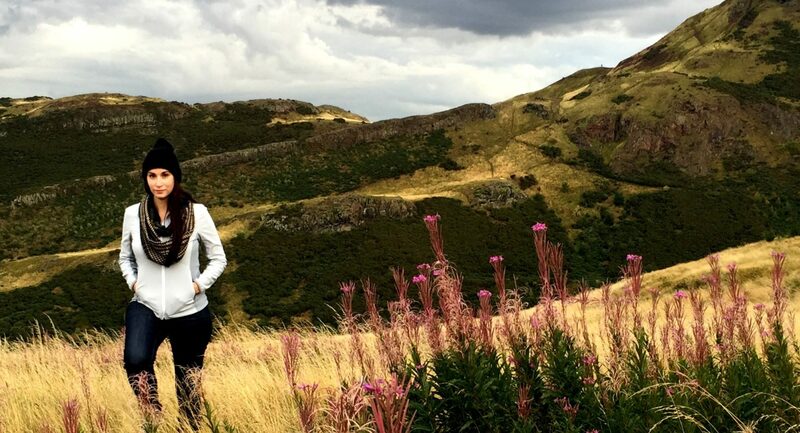 Check out the first post in this series, Sarah with an ‘h’. 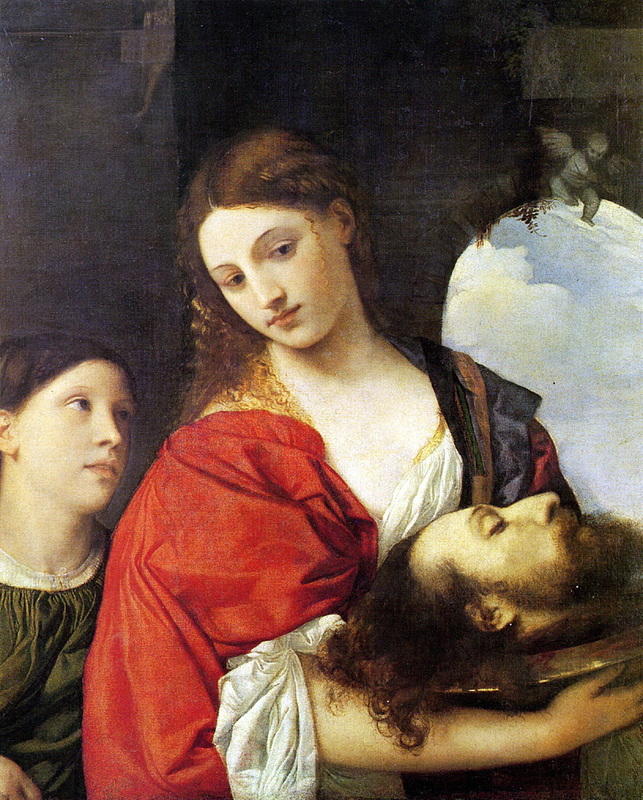 I’ll never forget the first time I saw Judith with the Head of Holofernes, I was enthralled. Who was this woman? One hand grabbing the hair atop a decapitated head, her other holding the knife, and an expression that dared you to ask her what she had done. 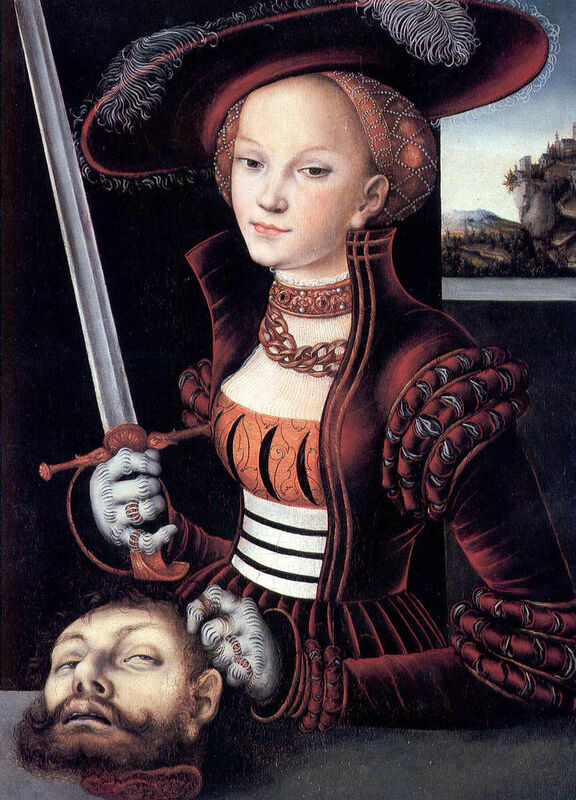 Her face so determined, her skin so pure,… her dress so clean for having just cut a dude’s head off. There are many, many paintings of this biblical story. 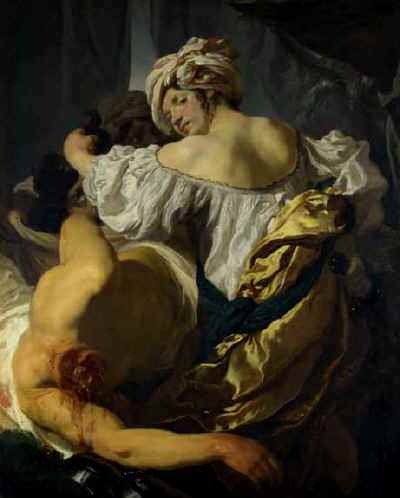 In some, the artist chooses to show the Judith caught in the act, slicing through Holofernes neck with blood gushing and staining the bed sheets. Others show Judith demurely holding a platter with a head on it, but it could easily be a roast, she seems just as disinterested. 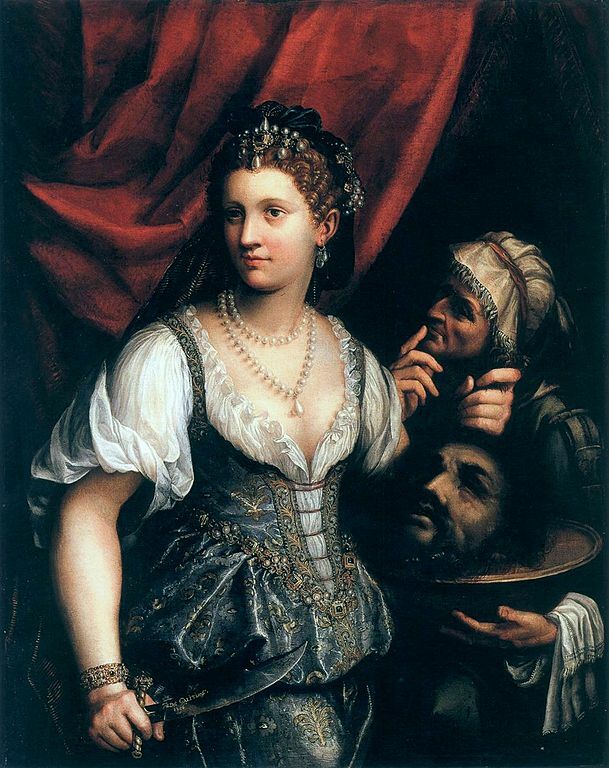 Some artists show Judith wearing a European headpiece and dress, while in others she is barely clothed and seductively posed. I’ve seen probably 6 or 7 in various museums around the world, and no matter the artist or style there is something about these paintings that is extraordinary to me. Who was this woman? Why had I never heard of her? Note: The Book of Judith is found in the Apocrypha, a group of fifteen books that were part of the Greek translation of the Bible, but not accepted by the protestants because they were not part of the original Hebrew Scriptures. 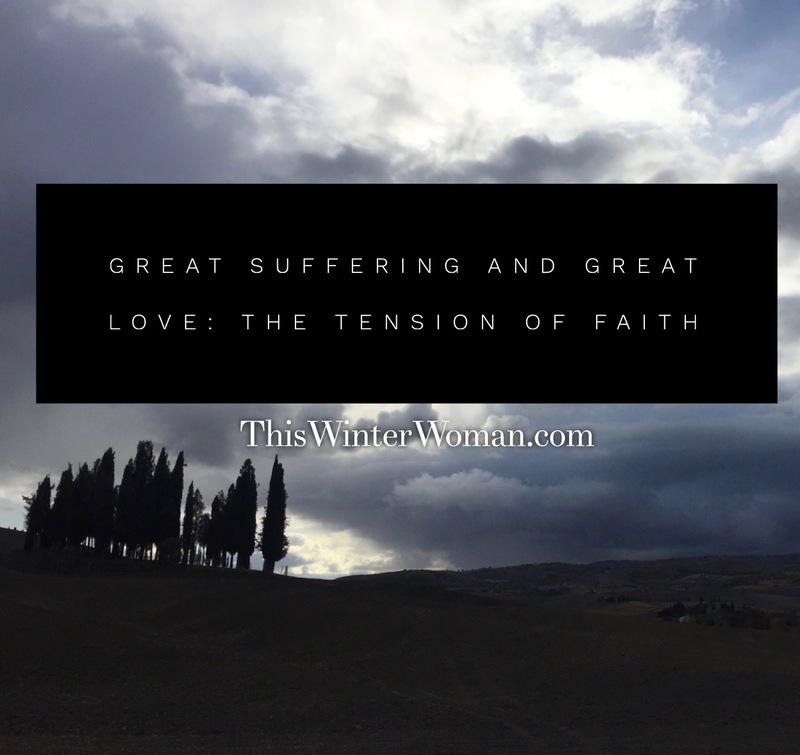 Judith was a wealthy widow who lived in the hilltop town of Bethulia, a town perfectly situated as a gatekeeper for the rest of Israel, get through Bethulia – get to Israel. Which is what the Assyrians, led by General Holofernes had been trying to do. We meet Judith on the 34th day of an Assyrian siege on the little town just as the water supplies are running dangerously low. The towns people have all but overthrown the government and demanded their leaders surrender to the General. The governor tells them that if after 5 days God does not deliver them from the hands of the Assyrians they will surrender. And then she tells them that she is going to take care of this, and not to ask her of her plans. I mean honestly. This woman is amazing. After she dismisses the leaders, she sets about the business of saving her people. First she prays, then bathes, then she dresses. She removes her widow’s clothing and adorns herself in her finest dresses. She anoints her body with scented oils. 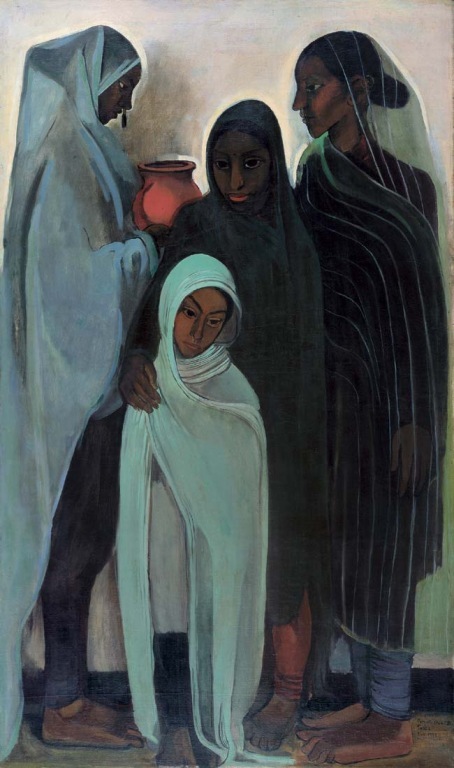 As she leaves the town with her handmaid and enters the Assyrian camp, it is quite clear she is relying on her femininity and sexuality to get her to Holofernes. The text is not subtle here, it describes the way the men at the camp are enthralled with her beauty and do whatever she asks. 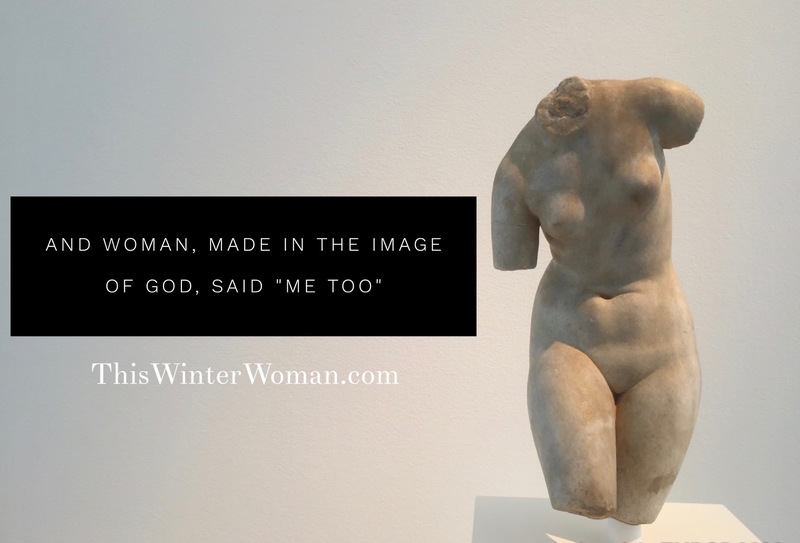 This is probably a good place to mention why some scholars believe the Book of Judith is not found in the protestant Bible – its loaded with sexual overtones and undertones. As she presents herself to Holofernes, who is immediately interested, it is clear that she is using herself to get as close as she can to the warlord. Holofernes “invites” her to dinner every night for three nights. She is basically taken prisoner now. Before Jesus was in the tomb for three days to save Israel, Judith was dining with Holofernes for three nights to save them. By the third dinner Holofernes is so comfortable with her that he gets himself piss drunk and passes out. His plan was to seduce her but that doesn’t quite work out for him. Here is where Judith becomes the Kill Bill version of Esther. She is more than a pretty face, she is a cunning mind. 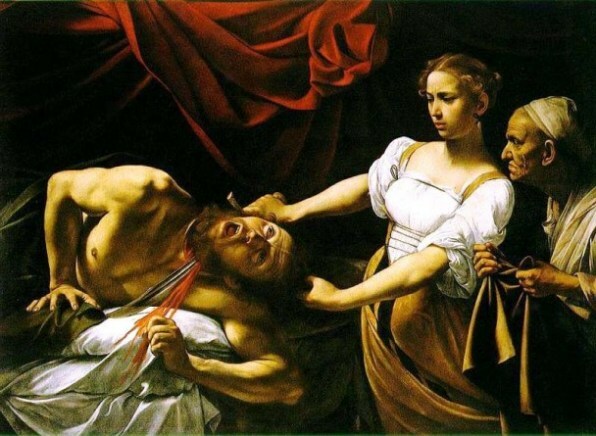 Judith takes Holofernes knife from his sheath and brings it down on his neck twice, separating his head from his body. She takes the head, passes it to her handmaid who is waiting outside, and they leave. It’s probably a good idea to mention another reason why this book is not found in the Protestant Bible- it’s morally ambiguous, not to mention unladylike. Judith is a virtuous heroine, buuuuut also a murderess. The ends justify the means. She sings a song of praise to God and praise of herself, dropping in more than one feminist line. That’ll preach. Imagine coloring that page in Sunday school as a little girl. No thank you, I don’t need a slingshot, I’ll use a man’s lust against him and his own sword to save my people. I just love this story. 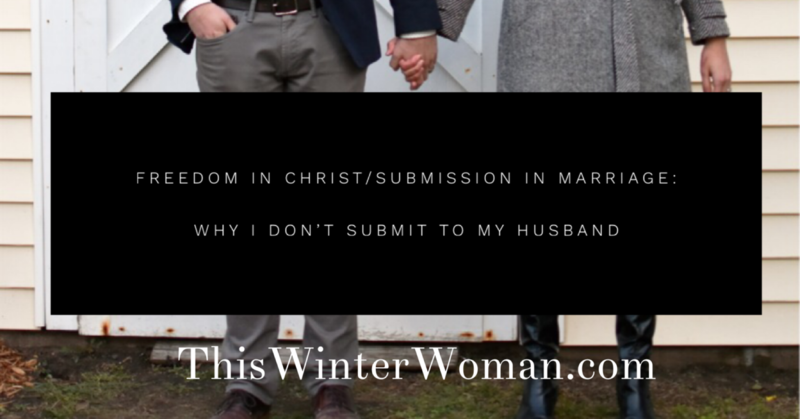 I love how she defies expectations of biblical womanhood. She takes matters into her own hands. She spoke truth to power, she stood up when her leaders were wrong. 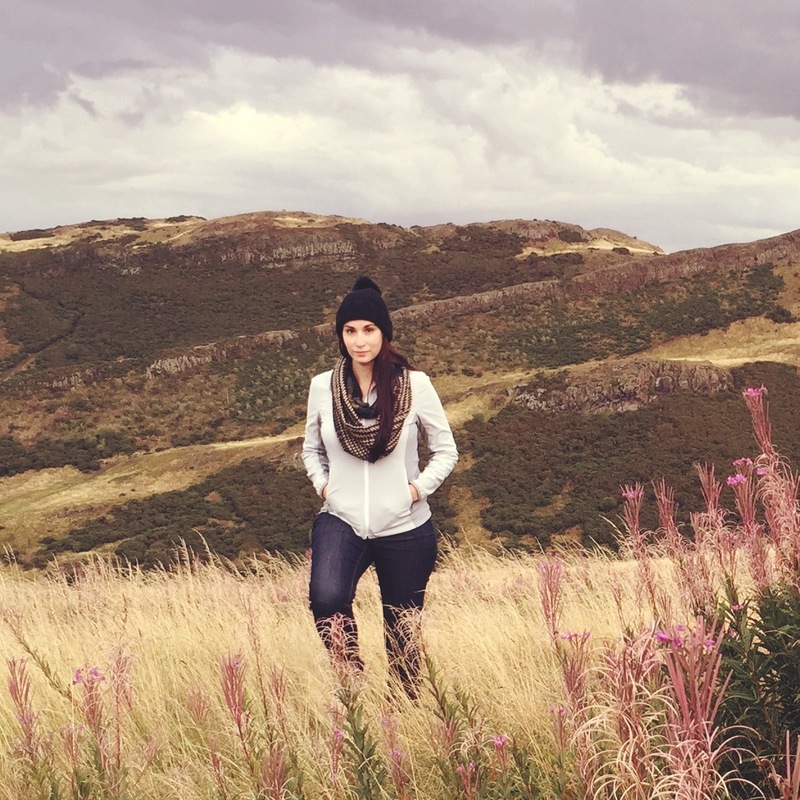 She sought God, prayed through it all, but did not wait for something miraculous to happen. She made the miraculous happen. 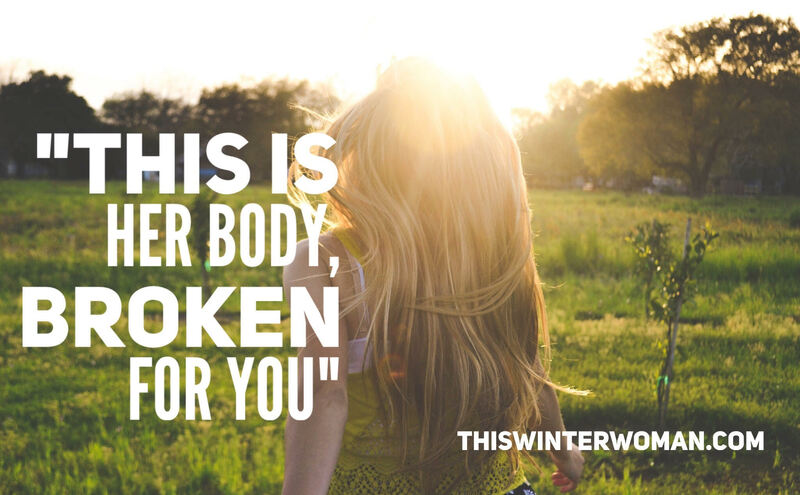 She put her life and her body on the line for her people, just as Sarah did, just as Esther did, just as Mary did.